So here there are Cicada beetles in Taiwan that are pretty noisy. They like to 'sing' and they are very loud. It was amazing when driving through Zhong Shan village which isn't far from Nantou. It was a huge chorus of singing. I loved it. Zhong Shan village is a residential area that is beautiful. The streets are flanked by wonderful old trees. I'll take some pictures next time I go there. (Once I get Zach's scooter). But at the moment i'm not so fond of them because there is one, only one, outside of my apartment somewhere which is bloomin' loud! It is irritating me so much because no matter where I am in my apartment I can hear it. And it is pretty constant. 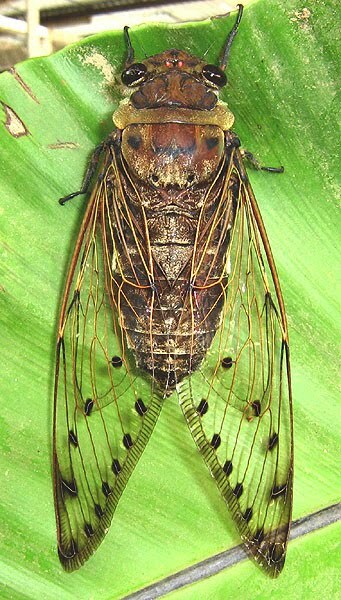 This is a picture of a Malaysian Cicada.